Chef competition highlights state’s beef production, 160 years of Van Vleck Ranch In a nod to California’s proud heritage as a beef producer, the region’s Farm-to-Fork prominence, and to celebrate the 160-year anniversary of Van Vleck Ranch in Rancho Murieta, chefs from five of Sacramento’s top restaurants will gather at the historic Stanford Mansion to compete in a cook-off highlighting beef as part of family- style entrees. 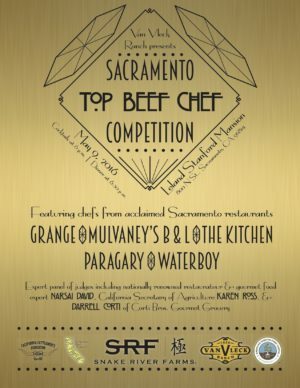 Billed as the “Top Beef Chef” competition, the invite-only event will honor Van Vleck Ranch’s 160 years of operation in Sacramento County, its sustainable contributions to the state’s beef industry and its commitment to the region’s thriving farm-to fork tradition. For more information on Van Vleck Ranch visit www.vv-ranch.com.